This time it was Lund and a new place to try. We where first as usual (that’s what happens when you meet for dinner at 5) and thus rather good service. 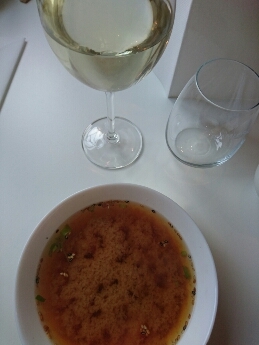 By the time I gulped down the rather strange miso soup and a couple of tastes of the wine my shoulders came down a little bit. 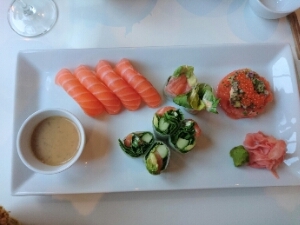 And after polishing of this plate of salmon goodness I was cool and relaxed. Everyone should have their own Latte Mum, she’s magic for my mood 🙂 now I’m ready for a relaxing weekend without any musts.